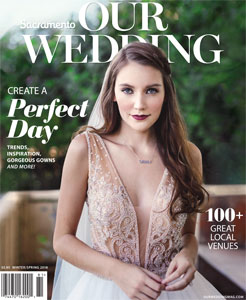 Since 2007, Our Wedding has established itself as the most beautiful and informative local magazine for anyone getting married in the Sacramento region. Sacramento Magazine’s Corporation, publisher of the region’s premier city magazine, SACRAMENTO, since 1975, also publishes Our Wedding twice each year. Each issue of Our Wedding is an invaluable tool designed to help the Northern California bride- and groom-to-be plan the wedding of their dreams. Insightful editorial is full of ideas and helpful tips for planning every sort of wedding, from classic and formal to cutting edge, with the latest in wedding trends. Newlyweds tell their stories and share what worked (and what didn’t) on their Big Day. Gorgeous, photo-filled features make the magazine enjoyable to read and a precious planning resource. Beyond bridal shows, copies of Our Wedding are distributed at the region’s largest consumer events that draw a high proportion of women, including 50+ events that Sacramento Magazine attends.